Senate Keystone vote: GOP clears bill to fast-track the polarizing pipeline. 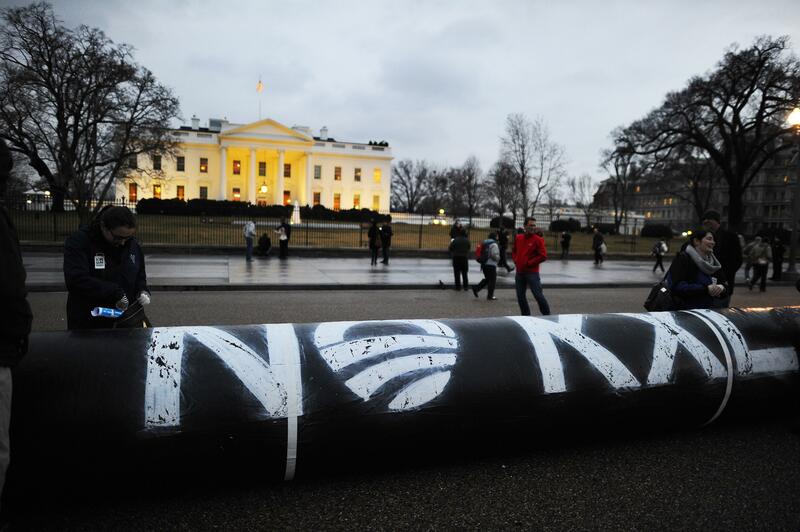 Senate Pushes Through Keystone Bill. Next Up: Obama’s Veto. Environmental activists have turned the pipeline into a climate litmus test. After an unexpected delay earlier this week, Senate Republicans finally scored their first legislative victory of the year on Thursday. The upper chamber voted, 62-36, to fast-track construction of the Keystone XL pipeline. Nine Democrats crossed the aisle to help push the GOP-authored bill across the finish line. President Obama has promised to veto the bill. Before that happens, though, there is still one more procedural step that needs to happen. Because the Senate modified the version the House approved earlier this month, the lower chamber will either need to vote on it again or opt to hammer out the details in conference before having both chambers give their final stamp of approval. Neither option, however, will prevent the legislation from reaching the president’s desk. The Democrats who broke ranks to vote in favor of the polarizing pipeline were: Michael Bennet of Colorado, Tom Carper of Delaware, Bob Casey of Pennsylvania, Joe Donnelly of Indiana, Claire McCaskill of Missouri, Joe Manchin of West Virginia, Heidi Heitkamp of North Dakota, Jon Tester of Montana, and Mark Warner of Virginia. As I explained earlier this week, during the Senate floor debate things went from bad to worse to downright miserable for anyone who believes in the reality of man-made climate change. Democrats may have been able to score a few political points along the way, but those were hollow victories given the larger message Republicans sent to the world at large, which was: The U.S. Senate does not believe that humans contribute to climate change. Given Obama’s looming veto, the political posturing on the floor—not unlike the bill itself—was largely symbolic. But messages matter in this fight more than most, particularly ahead of this year’s U.N. climate conference in Paris, where the president will have to convince the rest of the world that the United States is serious about combating global warming.